There are no photos with those IDs or post 25728 does not have any attached images! The festival is a Declared Festival of Tourist Interest and will take place May 11,12 and 13 days in Santolaya de Cabranes. We give you all the agenda of events to enjoy that weekend. Opening of the festivities by the Official Chronicler D. Enrique Corripio Monestina, appointment of the Xana and Xanín of the Festival and presentation of the Painting of the Festival Work of the local artist Santos Monestina. Placement of the Paraguaes in the Tree of the Emigrant Square that, according to tradition, will frighten l'orbayu during the festivities. Chupinazu will open the Fiestas de San Francisco 2018. Price: Adults 18 euros - Children 8 euros, up to 12 years. Registration until Wednesday May 9 at CASA JOSELU 985 89 80 11 and CASA SUÁREZ 985 89 80 12. Organization 677 395 680. Verbena "GRUPO TAXI" of Asturias and "DISCK JOCKEY ANDRÉS". DAY OF COUNTY CHILD COEXISTENCE, in Santolaya. A bus will pick up from the morning 10 all the children of the council and the CRA La Coroña wishing to participate, previous registration. From the 11: 00 h. until the 16: 00 h., games, and fun with children's entertainment. At 13: 00 h. food already at 16: 00 h. I return by bus to home. 25 Official Championship of Pourers. 1º Contest of the scoring year for the championship of Asturias. At 20: 00 h. awards. Verbena "GRUPO K-LIBRE" and "DISCK JOCKEY ANDRÉS. · 10: 00 hours. Official reception of the different Gastronomic Guilds invited to the V Grand Chapter of the Confraternity of Rice with Milk in the Social Center of the City Council of Cabranes. · 11: 00 hours. Civic parade through the streets of Santolaya, of the brotherhoods accompanied by the Banda de Gaites de Villaviciosa "El Gaiteru" and the Villaviciosa Folkloric Group. 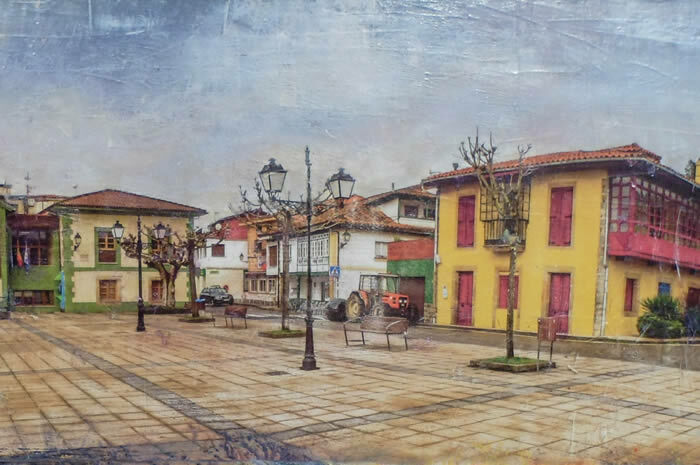 Collection of the Festival's painting, work of Local Artist Santos Monestina, in the Lavaderu of El Vallín and return to the Emigrante Square. TRADITIONAL MARKET with 40 craft stalls and agri-food products during the morning. · 11.30 hours. Act of the V Grand Chapter of the Confraternity of Rice with Milk, in the Plaza del Emigrante, with the presentation of new members and oath. · 11: 30 hours. MASS IN HONOR TO SAN FRANCISCO DE PAULA in the Parochial Church of Santa Eulalia, and followed by the traditional procession to the Plaza del Emigrante, accompanied by the Banda de Gaites de Villaviciosa "El Gaiteru" and the Villaviciosa Folkloric Group. · 13.30 hours. PREGÓN and INSTITUTIONAL ACT FROM THE XXXIX RICE FESTIVAL WITH MILK. · 14.00 hours. Public failure of the festival contest and awards ceremony. During the morning, a Free tasting of rice with milk from Cabranes, offered by the local dairy products company SANTOLAYA, and commemorative trunks of the Festival may be purchased. There will be two shuttle buses from the Benjamín Prida Cuesta Business Park to the Church from the 11: 00h in the morning to the 15: 00h in the afternoon.